Jefferson Randolph Smith was born in 1860 at Newnan, Georgia to a well-to-do family. Notwithstanding, he became a criminal known variously as “Soapy” (because of his most celebrated trick) or as the “King of the Frontier Con Men”. The nickname Soapy came about through the Prize Package Soap Sell Swindle. Smith would hide money up to the value of $100 under the labels of bars of soap and then sell the bars for $1 each. “Shills” (or accomplices) in the audience would buy the soap containing the money and then announce their finds thus encouraging the punters also to invest. Needless to say, the only money ever found was in the bars sold to the shills. 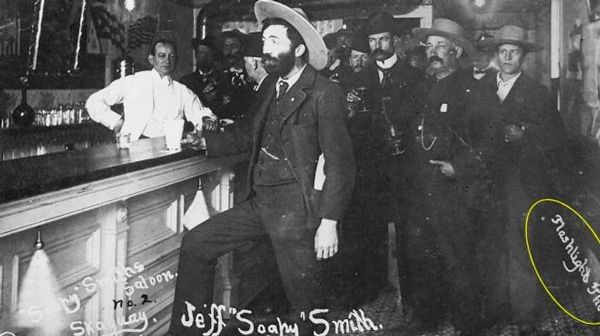 Smith was one of the most adroit con artists operating in America in the late 19th century. He was also — perhaps because of a guilty conscience — a generous contributor to charity. Smith operated out of Denver and Creede, Colorado from 1879 until 1896 and then from 1897-98 at Skagway, Alaska. In 1897 Skagway had a gold rush and Smith, ever keen to make an easy dollar, had his men (he called them his “lambs”) set up a fake telegraph station to send telegrams, at $5 each, to the miners’ homes. As the message was prepared the miner was pumped for information on his background and finances and then invited to play poker during which he would lose everything. To add insult to injury, the telegraph line did not reach Skagway until 1900. In 1898 the townspeople of Skagway tired of Smith and his men and a gang of vigilantes was formed to run them out of town. On 8 July 1898 a guard by the name of Frank Reid prevented Smith from entering the town. The two engaged in gunfire — Smith always carried two revolvers and a double barrelled rifle — and Smith died of his wounds that night. Reid expired 12 clays later.